My poor slow cooker. It hasn’t seen much use. Such a shame, really. As for Mr. Prevention, I was sensing an imminent request for buffalo chicken SOMETHING for dinner, so I beat him to the punch and threw this recipe on the menu. The man is easy to please when it comes to buffalo wing sauce – I think he would eat Styrofoam…if it were covered in wing sauce. That said, I changed a few things about this recipe. After about 8 hours in the slow cooker, I taste-tested. It wasn’t buffalo saucy enough, so I added more. While this meant a higher sodium content in the final product, I own this decision because a few extra tablespoons really did make all the difference. I also decided that the recipe was unnecessarily complicated. When the original recipe called for cooking the veggies and chicken before putting them in the crock pot for 10 hours, I was a bit confused. Outside of a quick sear on the stove top, this step seemed to defeat the use of the crock, so I threw it all in there and called it a day. Worked beautifully. I also omitted the cornstarch and several transfers of liquid to and from the crock — no need. I whisked the flour into the half and half, and that was that. Basically, I cut out most of the busy work and still ended up with what I would call a my man’s dream. And wouldn’t you know that Mr. Prevention felt there was too many potatoes and not enough chicken in this dish. Of course I disagree (there’s only 2 potatoes! ), but hey, we’re all entitled to our own opinions…it’s just that some are correct, and others are not. I highly recommend serving this with some high-quality blue cheese crumbles and the raw celery. The final touches really send this humble meal over the top! Peel and cube potatoes, add to the slow cooker. Add diced chicken, then the onion and celery. Sprinkle in celery seed, salt, pepper, thyme, and red pepper flakes. Carefully pour in half-and-half, chicken broth, and buffalo sauce. Gently stir. Remove roughly 1 cup worth of liquid, add flour to the liquid. Whisk well until smooth. Pour back into the slow cooker. Stir well. Cover and cook on high for 5 hours or low for 10. Before serving, stir well. Top off with blue cheese crumbles and a drizzle of buffalo sauce, if desired. 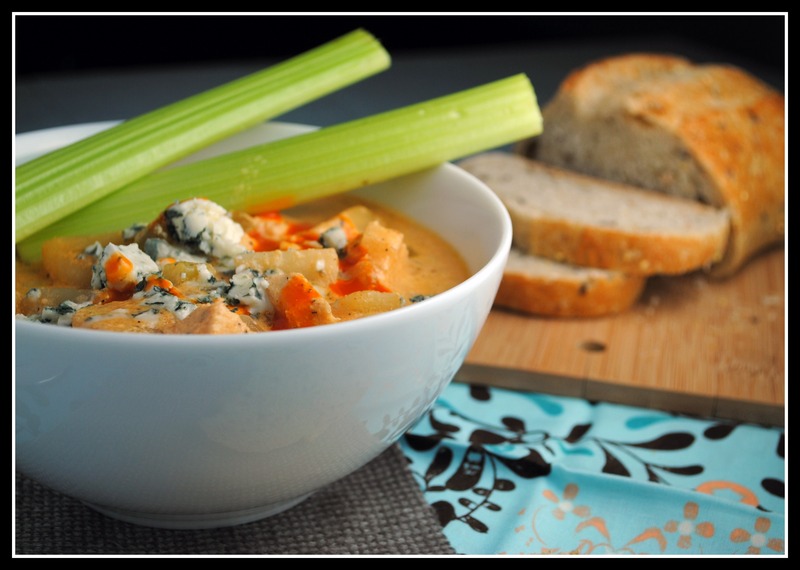 Serve with celery stalks. Yield: 5 servings (1 1/2 cups each). Result: Spicy and rich with half and half and blue cheese crumbles. As noted above, Mr. Prevention would vote for more chicken and less potatoes, while I was happy with the meat-to-veggie ratio. This ratio also helps to keep the calorie count down, while still providing a great source of protein. The crock pot worked great and this dish is one that can definitely stand up to long work days – I don’t think you could really “overcook” this one, and it can certainly be assembled ahead of time to just throw in the crock before leaving for the day. Enjoy! Money Matters: I bought organic potatoes on sale ($1.60/lb), so the 2 cost about $1.20. Chicken I always buy from Trader Joe’s for $3.99/lb. In the whole recipe, I used 1 head of celery — $0.99 (I buy them in a package of 2 for $1.99). 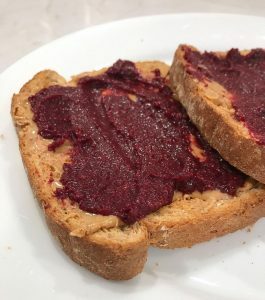 Onions are $0.50 each from CostCo – I used half of one in this recipe. Wing sauce we usually pick-up at a discount store or when on sale for about $2/bottle — about 1/4 of the bottle was used ($0.50). I got a half pint of half and half for $1.19. The blue cheese was the most expensive ingredient — $4 for a 6 ounce piece. The total cost of the recipe comes to $10.52, or about $2.10 per serving! It’s going to be a long one today. Clinic then class…see ya later! Hi Emily! I am really not sure. I worry about the milk curdling, but I think it’s worth a shot! This looks amazing! I really want to show my roommate your site. However, I’m terrified she would never ever leave it! We’ve become quite obsessed with what a crockpot can do. What a genius idea! I am all about soups right now even though it is so hot here. 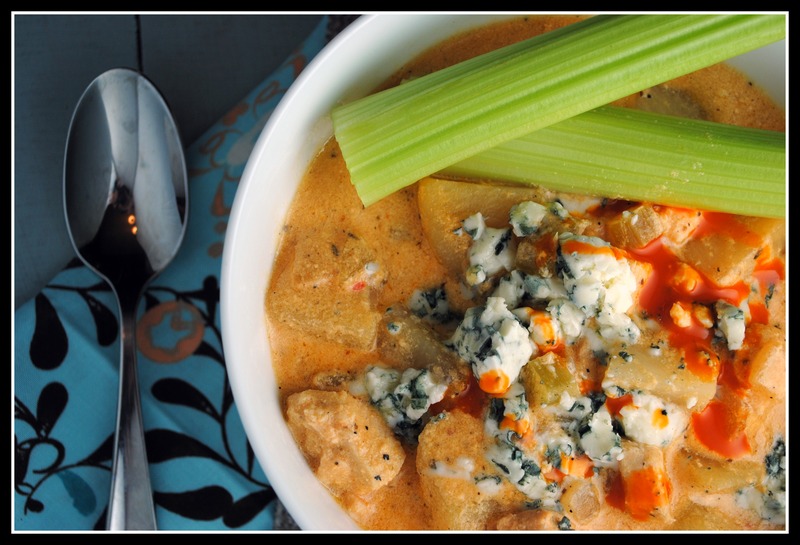 Hopefully we get a cold front soon and I can try this soup. Wow I am very intrigued by this dish. I love buffalo sauce, but I am hoping this soup isn’t too overpowering. Guess I’ll have to try and find out! My slow cooker is barely used as well, poor thing. This looks delicious 😀 I love using my slow cooker and I’d like to use it more but I don’t have enough recipes for it. I love those buffalo flavors! Well Nicole, you’ve done it again. I cannot wait to try this! I think I would like this chowder! 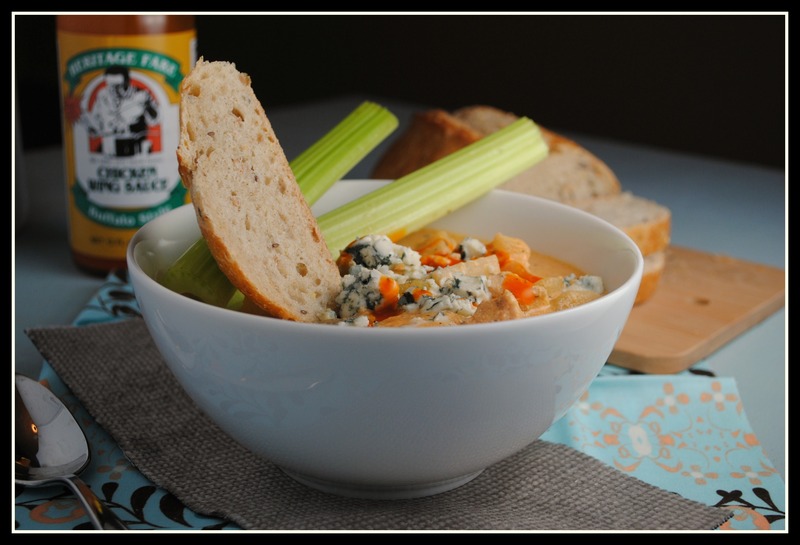 Esp that blue cheese on top….geez Louise that cheese looks fantastic! 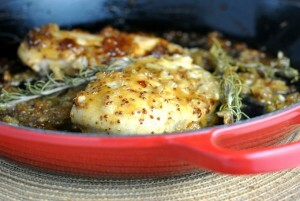 This recipe looks really delicious and I’m sure my hubby would love it, I can’t wait to try it! I have missed your food. I often sub fat free evaporated milk for half and half – do you think that would compromise the dish too much? 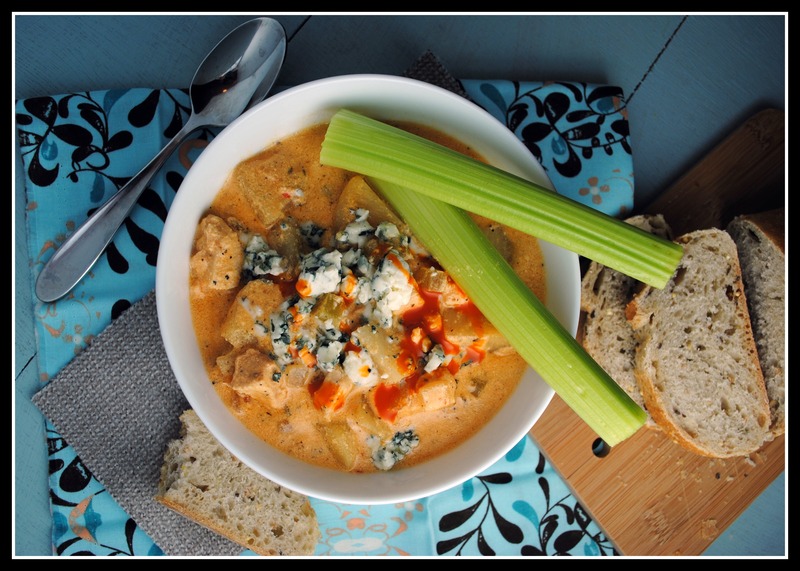 I was very excited to try this recipe since I love chowder and buffalo chicken! It smelled so good when I came in from work but I found it had separated when I took the cover off. I used fat free half & half – would that make it separate? Sue: Sad! Yes, fat-free products generally do not do well in the slow cooker because they either curdle and/or separate. I’m sorry! I normally use fat-free products when I can, but I knew it wasn’t an option in this recipe. I hope it’s salvageable! Maybe try mixing in a bit of cornstarch, if you have some. thanks! lesson learned…I just started using more fat free ingredients. I am going to try it again with regular half and half. I can’t wait!! I tried to make this yesterday. Unfortunately, not successfully, it curdled. I doubled the recipe and used 2 cups half and half and 2 cups unsweetened almond milk. Is that where I went wrong? Hi Catherine, soups with a milk base require a substantial amount of fat to avoid curdling. I have no doubt that the almond milk was not high enough in fat to prevent that. I’m sorry!! This sounds delicious. And this is probably a dumb question, but do you cook the chicken first before putting it in the crock pot or put it in raw? Not a dumb question 🙂 It goes in raw.